At Green At Home Ltd Gardening and Landscaping services we offer the Ideal, fastest and economical way to clean and shine any external surface in your home and garden. Jet washing the wooden deck or patio in your garden. 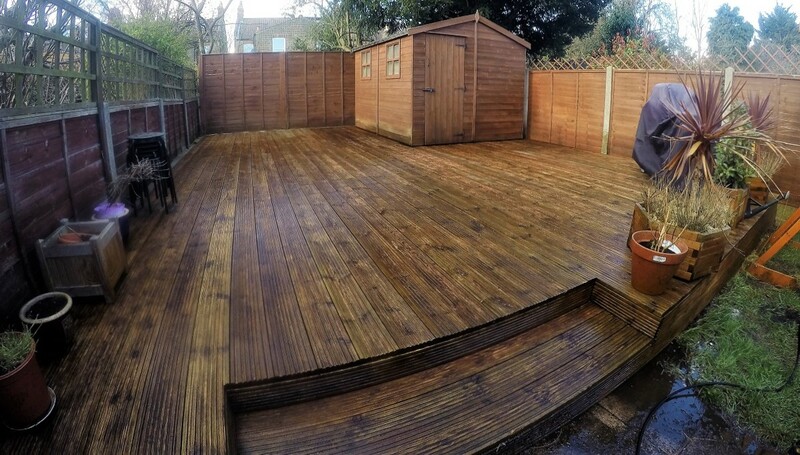 Wooden or plastic external furniture or garden fence will quickly shine with our professional pressure washing service in London. Using a pressure washer to get rid of all the algae, lichen and moss that is covering your patio. Green At Home Ltd professional jet wash service help you skip the hard work of using a manual scrubbing brush. Our powerful pump and narrow nozzle make pressure washers blast water in a forceful spray, which will remove dirt and grime quickly while using water more efficiently than a normal garden hose. Green at Home LTD 02034880780 / 07508297460 - provide safe and professional pressure washing service for your driveway, patio, garden decking many more.